A triceps muscle or biceps muscle rupture are the most common musculotendinous (muscle and tendon) ruptures. The triceps muscle extends the elbow, and the biceps muscle flexes and supinates the elbow. A triceps muscle / tendon rupture is a less common cause of elbow pain and its usual presentation is posterior to the elbow. Triceps tendinopathy is a more common cause of posterior elbow pain and may result from chronic degeneration of the triceps muscle due to abnormal scar tissue formation. Similarly, the biceps muscle / tendon may be injured due to a variety of traumatic injuries. 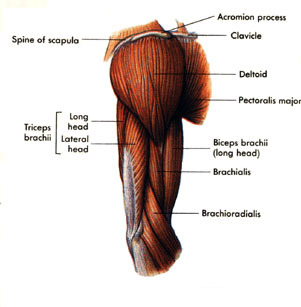 This is also true of the brachialis muscle, which lies underneath the biceps. Referred to as climber’s elbow, repetitive flexion of the elbow from rock climbing or long-term weight lifting can cause a strain of the brachialis muscle. Bull riders have been known to rupture these muscles as well, due to the mechanism of the sport. If the biceps muscle or brachialis muscle is not ruptured, a tendinopathy may occur, which is a chronic degeneration or scarring of the musculotendinous region. Tendonitis, which is an inflammatory process, is usually acute in nature. The presentation may be diffuse arm pain or pain about the anterior aspect of the elbow. Tendinopathies are becoming more frequently recognized as a source of chronic musculotendinous problems and pain. Clinical studies have failed to show inflammatory processes in the musculature, but have actually shown degenerated collagen formation and scarring that is occurring. This is why these chronic injuries fail to respond to anti-inflammatories, corticosteroid injections and some conservative physical medicine modalities. An alternative to surgical treatment for a triceps or biceps muscle rupture is the use of platelet rich plasma (PRP) or stem cell therapy. Platelet-rich plasma (PRP) and stem cell therapy are regenerative medicine techniques, the goal is to help to regenerate the tissues that are chronically irritated and inflamed or undergoing degeneration or scarring. With platelet rich plasma (PRP) therapy, the healing and growth factors in a person’s own blood are captured and injected into the injured area. This could help heal the damaged tissue more quickly. Additionally, stem cell therapy could help regenerate damaged tissue. Stem cells can be processed from either a person’s own bone marrow or fat cells. Once processed, the stem cells are directed into the injured tissue using a variety of techniques. Platelet rich plasma and stem cell therapy are innovative and cutting-edge treatment techniques that could help repair chronic or acutely damaged tendon and muscle problems. If you suffer with a triceps or biceps muscle or tendon rupture and your current treatment plan leaves you wanting more options, perhaps a fresh set of experienced eyes can change your outlook. Since 1990, Dennis M. Lox, M.D has applied his personal interests in sports medicine, cutting-edge regenerative medicine and chronic pain management to helping patients increase their quality of life. Contact us for an appointment at 727-462-5582.